There are many ways to advertise your business, and a lot of them involve banner stands. Banners came in a wide range of styles. They can be portable or static, vertical or horizontal, full-colour or grey scale. Banners are essential when you’re promoting yourself at an outdoor event, or at a seasonal expo. You can also use them for incidental advertising and sponsorship at festivals and concerts. Our Banner Bug Media Wall is a popular item that is commonly requested for exhibitions and conferences. It can also be used at presentations because it’s easy to put up and even easier to carry around. The beauty of this retractable banner is its ease of installation. It has been called the quickest, simplest, and most flexible banner in the market. The Media Wall can stretch up to 3 metres high, yet it retracts into a small nylon case, complete with wheels for ease of transport. The Media Wall offers a dramatic effect, thanks to its massive size and its high-definition full-colour print output. It comes in three different sizes and depending on how you position it; it can effortlessly steal the show. Most companies invest in a multitude of small banners because they are worried about storage and cost. You can stand out from the competition by building your display around an attention-grabbing Media Wall. It can be just as effective at 1800, 2400, or 2900 mm, so the size you select will depend on the dimensions of your exhibition stand. If you’re worried about the durability of your Media Wall, that’s not an issue. The protective nylon bag keeps it safe and well contained, and the banner is made with high-grade materials that are specially engineered for longevity. Unlike other kinds of banners, all 3 metres of this Media Wall is manufactured as a single piece, so you don’t need to be concerned about breaks in the image. The materials used to make the Media Wall are fully crease resistant, and any graphics that you utilise are easily interchangeable. Depending on how often you use your banner and how long it remains on display, it’s likely to get a little dirty. Maintaining banners is a simple matter. First, keep it in its protective case when it not being used. Before you stow it away, wipe it down with a soft, moist cloth. Make sure the cloth isn’t abrasive so that you don’t scratch the material. Avoid sponges, since they might have rough particles trapped inside them. The printing on our Media Wall is weatherproof, so you don’t have to worry about it washing off. But be sure you don’t apply harsh detergents on it, as the solvent may dissolve the printing ink. Also, make sure the banner is fully dry before you put it back in its case. Storing it while wet could cause mould to grow. And remember to wipe the carry-case as well. 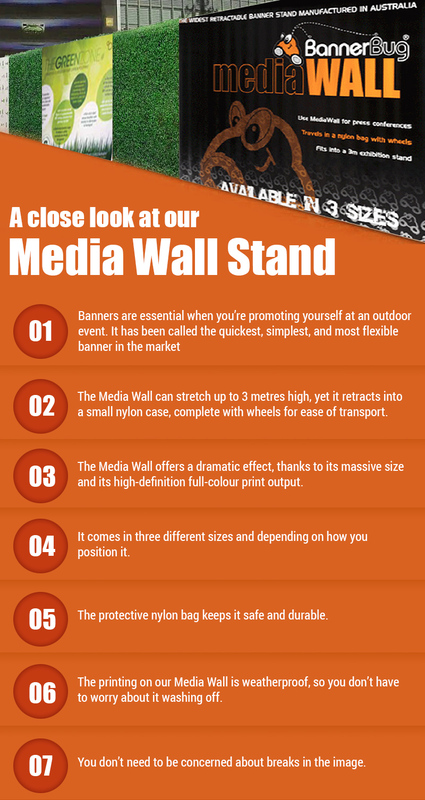 If you’d like to order a Media Wall or any other kind of banner, please get in touch with us on +61 02 9663 5333 or email us your specifications at info@bannerbug.com.au.